When Ellen Grossman met Jay-Z on the subway, the media paid attention. The Local visited the East Village artist to take a closer look at her art. Ray Sumser, a Californian artist who recently moved to the East Village, has been working on a series of cartoon projects. His goal: to portray the “most recognizable characters” from popular cartoons. He’s been bringing his art to public spaces like Union Square too. Last Saturday, the event known as “Unsilent Night” took place in the East Village for its 20th year. This winter time annual event has garnered participation from cities around the world, including San Francisco, Chicago and Melbourne. But it all started in New York. The Local embedded with creator, Phil Kline, in the days before his New York and Philadelphia Unsilent Night events, in order to get an inside look at how he prepares. The parade of devices playing Kline’s music started out at Washington Square Park. Participants carried boom boxes, iPhones or other portable audio equipment, cranking up the music in unison. The composition was timed by Kline to finish just as everyone arrived at Thompkins Square Park. If photos of the anti-Republican fervor that overcame much of the city in 2004 didn’t make you feel patriotic, perhaps this footage of the TOWN Sidewalk Festival at 26 Astor Place will. Yoga demonstrations, the Standard East Village’s ice cream, and a food truck displaying art were all on hand — set to the soundtrack of Hendrix’s “Star Spangled Banner.” The event continues for another half hour. Here’s video of workers demolishing the building on the corner of Avenue B and East 12th Street that held the Elim Pentecostal Church and before that, a theater that was a locus of 1960s counterculture. A 40-unit, seven-story condo will be built at 193 Avenue B, with the church returning to the ground floor and basement. Earlier today, the walls of the Bijou (later the Charles) Theater were being demolished brick by brick. Blackbird, the bar that was set to fill the former Lakeside Lounge space next week, will be opening a little earlier than expected, according to Maria Devitt, the longtime CBGBs bartender who’s a managing partner. The one and only Jonathan Toubin, of the popular “New York Night Train” parties, will spin sounds from the 60s on Sunday. As previously mentioned, the new bar won’t have live music. If that’s got you bummed, check out footage that hit Vimeo yesterday, of Jim Keller – best known for scoring a hit, “867-5309/Jenny,” with the band Tommy Tutone – performing his own song, “Soul Candy,” during Lakeside’s final days. New York Police Department Surveillance footage of the suspect. An East Villager’s surveillance camera caught a gloved burglar snooping around inside his apartment on August 6. A police spokesman did not have further information on what type of video camera captured the suspect, or what valuables he swiped. But the camera sure did get a good look at him. It’s not quite sweater weather, but as nights and mornings get crisper, fashion is making the transition with light cover-ups. The button-up shirt is one example: We’ve seen it paired with a summer sundress or with shorts and tights. Denim, chambray and white linen (some of our favorite looks) maintain their shape best when worn as outerwear. With extra material, the button-up can be tied in a knot and worn over a dress or longer skirt. See how Villagers are sporting them on the street. Street Style: Tucked In from rachel ohm on Vimeo. Sometimes style isn’t what you wear but how you wear it. Tuck a blouse or a tank top into a skirt or dressy shorts and voila! you’ve created a slimming silhouette. As The Local wandered the streets of the East Village, we noticed that “the tuck” is both work and weekend appropriate. It lends a touch of femininity to any skirt and top combo and instantly polishes up summer-time shorts. It’s also a great way to test the waters of color blocking, as these stylish locals showed us. The Local’s Rachel Ohm reports. 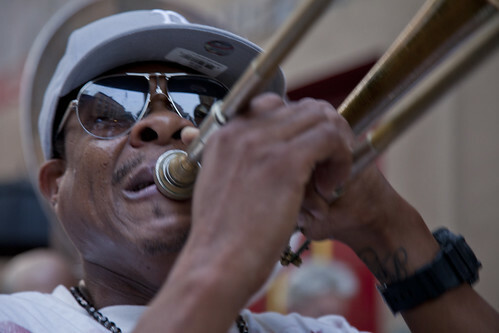 Joshua Davis About 150 people turned out for a Second Line tribute to Ray Deter. A trumpet sounded. A trombone rose. And in a mix of mourning and celebration, dozens of feet danced up First Avenue Monday night in a true New Orleans tradition — a Second Line parade honoring the life of Ray Deter, owner of d.b.a. bar who died July 3, six days after he was struck by a car while cycling. 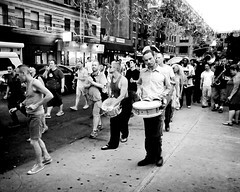 About 150 people turned out for the march, which wove from the bar on First Avenue through the East Village and ended at Mr. Deter’s Sixth Street apartment. The procession spilled out from the sidewalks and blocked traffic for several blocks. 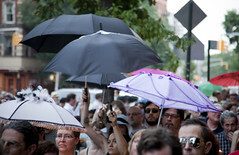 Led by musicians, the crowd sang songs, waved umbrellas and lit candles in memory of their friend. Linnzi Zaorski, a jazz singer, offered an a capella song in memory of her friend as the parade paused in front of the New York City Marble Cemetery where Mr. Deter’s memorial service will be held on Wednesday. Then she looked up, smiled and blew a kiss towards the sky. “We love you, Ray,” she said, as the brass music began again. The Local’s Laura E. Lee and Chelsia Rose Marcius share their video of Monday night’s Second Line parade honoring Ray Deter. On a recent afternoon in the East Village, the sun shone relentlessly on the sidewalks and streets of the neighborhood — to the dismay of some and delight of others (perhaps having the proper headwear helps?). A light hat in the style of the fedora, made from paper, polyester or other lightweight and breathable material (one gentleman sported a chapeau of Siberian horsehair!) may be the secret to a stylish and shady summertime stroll. In one interview, the East Village ambler in question was so attached to his wool hat that he insisted on wearing it year round. He noted that it was a “stogie fedora” because the brim was so small, and he wore the hat as far back on his head as possible. The name for this type of hat is actually the “homburg,” and it is characterized by the brim fixed in a tight, upward curl — an adaptation that suits it for summer in the city. Peppy patterns are all over the runway (and the sidewalk!) this spring. One of our favorites here at The Local is stripes, and we’re not talking about the blah black and white versions in the back of your closet. Stripes this season are either wider, with varying widths across the fabric, or a mix of horizontal and vertical across the body. Some of the most interesting variations also play with color, either bold primary colors, classic muted tones or bold neons. Take a look at some of our favorite takes on this playful and fun summer trend! The old maxim goes that when hemlines fall, so does the economy. But what are we to make of widening trousers? Perhaps we could say that as the temperature rises, the leg gets less lean? The look on the street these days is not skinny jeans and jeggings but pants that billow and bend in the breeze, keeping us cool while looking hot. The Local investigates ways wide-leg pants are being worn in the Village — from 70’s retro bell-bottoms to lightweight polyester boyfriend trousers and cargos. NYU Journalism’s Rachel Ohm reports. Chelsia Rose Marcius Nick Corbin, 24, of Hoboken, during the race. Grab, bite, chomp, chew, drink, swish, swallow, run. That was Miriam Weiskind’s strategy today at the second annual New York City Pizza Run in Tompkins Square Park. Nearly 100 runners registered for the 2.25-mile run that required three pit stops for one slice of Margherita pizza, said race founder Jason Feirman, 26, of the East Village. Ms. Weiskind, 31, of Park Slope, came in first for the women, clocking in at 18 minutes and 6 seconds. Peter O’Rourke took men’s title with a time of 15 minutes and 24 seconds. While a dim weather forecast kept some participants from showing, those who live for saucy pieces of dough had no problem wolfing down 40 pizza pies from Pizza by Certe in Midtown. To prepare for inhaling mouthfuls of basil leaves and mozzarella, triathlete Jonathan Blyer, 29, of Park Slope, spent three weeks chewing saltine crackers without water. He said what ruined him last year was a dry pallet. “My main problem was getting my salivary glands going,” he said. Most runners gave the choice of pizza a standing ovation — except perhaps Erin McInrue, 27, of the West Village. Ladies of the East Village, it’s time to stash your stilettos away and save your flip flops for the beach. This season is all about chunky heels, whether they are giving some lift to a pair of gladiators or height to your favorite strappy sandals. On the street, the wedge is a walking shoe with the height of high heels and all the glitz too. It’s sure to be seen as summer rolls around. The “maxi” dress, as its name implies, represents the fact that it’s cut at the maximum length possible. While often form fitting at the top, the maxi dress and the similar maxi skirt is long and flowy, covering up the legs and letting the toes peek out. As these East Villagers noted, the conservative cut lends well to funky patterns and its name also supports another of its virtues — maximum comfort! On the street the Local was not surprised to see these East Villagers looking stylish while staying cool and summer-minded! NYU Journalism’s Rachel Ohm and Claire Glass report. Handball washed up on the shores of New York about 150 years ago in the boats of Irish immigrants. It has since exploded in the city, as players of all backgrounds have adopted the sport as their own. When the weather breaks, tens of thousands flood the 2,500-plus handball courts in the city to take part in this fun, local game. Players from all over the city convene in the East Village at the East First Street and First Avenue courts, citing the fierce competition, ethnic diversity, convenient location as reasons to travel to the courts. The courts are a preferred place to get in shape, improve your skills and even win a few bucks on the side. NYU Journalism’s Greg Howard reports. Since the early 19th century, locals and visitors alike have gazed at the striking Gothic architecture of Grace Church, located on Broadway and 10th Street. However, if visitors were to venture through the church’s doors, they are also likely to encounter a rich crescendo of organ music. Grace Church’s artist-in-residence and concert organist, Stephen Tharp, helps to maintain Grace’s musical legacy alongside its master of choristers, Patrick Allen. Today, Grace Church is undergoing a massive restoration process. In addition to stained glass windows and ornate woodwork, Grace will fit the colossal building with a world-class organ by 2012. Besides Mr. Tharp’s career accomplishments as an organist (touring around the world, composing his own music, and performing for the pope), he is eager to fortify Grace’s musical legacy on its brand new organ. The Local speaks with Mr. Tharp about his current position as artist-in-residence at a church that is evolving both architecturally and musically. NYU Journalism’s Stephanie Buck and Kristin Buettner report. Spring colors are abounding and on the runway they’re brighter than ever. From the storefront to the street you don’t have to look hard for neons because they definitely pop! The Local takes a look at how some trendy East Villagers are livening up their wardrobes for spring and (dare we say!) summer with some fluorescent flair.